This week marks a personal milestone, I move from the comfort zone of a school working environment which has become familiar and has provided wonderful opportunities and move on to an exciting new adventure. Time for reflection, Time for appreciation, time for nerves and above all time for thanks. In a few short years the technology landscape in schools has changed beyond my wildest imagination. When I started working in my current position, I had never heard of a Chromebook or Google Apps for Education and most definitely knew little about coding. The iPad was not yet invented. I had never blogged or tweeted and my professional learning network was just in foundling form through mailing lists (List-servs). I had never been to an on-line or face to face technology conference, let alone presented at one and I had only experienced the atmosphere of a few schools. This could be construed as covering decades, but in fact was only eight short years. I now count the blogging and tweeting as commonplace and a regular part of my professional routine. The students in our classes today will never remember the way things were before and in many ways take their connectedness for granted. Watching the Olympics live from their Chromebooks, writing collaborative documents with peers and sharing their work to a potentially global audience are just what they do! I am glad to have the hindsight as it makes me more grateful of the opportunities around today. The things that remained constant are the people and the big purpose – to improve student outcomes. I have been blessed to be working with and amongst dedicated teachers who have been willing to try new things, adapt, consider, challenge and in some cases ignore. I have made so many mistakes, had false starts, trials and a few successes but all these were learning moments. My blog is the chronicle of much of that learning and I am grateful to have the evidence of my changing thinking. It was this Buzz that made the past eight years amazing in my school for me. Teachers have come and gone and stayed and each of us has taken on what felt relevant and comfortable for them. We have all learned from each other, questioned each other and made our own choices. The most profound understanding I take from this most recent experience, allbeit eight years, before I embark on another challenge, is the power and importance of relationships. The creation of a story alongside other learners, whether they be younger students or colleagues. If I had tackled these challenges on my own they would have had such smaller impact. This could have been at my own school, within the Teachmeet network (that also spawned in this era) and within the wider teaching network, both local and overseas created through Twitter and Blogs. I am a different teacher than I was eight years ago, the sum of added years with amazing experiences, failures and successes has given me confidence to move on. I would hope that that attitude was spread to others I have dealt with. I have most certainly come to agree with Seymour Papert (who passed away recently) . This philosophy has driven my interactions with teachers and students and will continue to do so. I know that I don’t know much, I am not really technologically skilful, I am however blessed with a questioning mind and that has allowed for many learning opportunities and it makes the next era very exciting. The end of the 2015 school year marks the end of my role as an eLearn Coach for the CEM ICON project. I was in this role for a short 3 years and as the year draws to an end, I am becoming more maudlin. My role saw me involved in schools in a variety of ways; discussions with leadership groups, small group coaching sessions, whole staff professional learning sessions, mentoring and planning etc. It also allowed me to support the wider network through connections with Learning and Teaching and eLearning networks. I was able to develop and build relationships and in all cases I learnt as much as I was able to offer. I considered it a privilege to be invited to share and learn alongside teachers who are doing amazing things in schools. It was a time of great change in our schools and in the ways technology is being used (but I guess when is that not the case in the past 15 years?). The ability to be agile, to adapt and keep on learning was essential for me but also for all the people I worked with, including my fellow coaches, from whom I learned so much and received a great deal of support and to whom I offer my sincere thanks. I am glad to say that there were many times when I was able to share my passion for being connected via Social Media and I am happy that the impact of that is obvious when I browse my Twitter and Google+ feeds. The experience has most definitely whet my appetite for developing my coaching skills as I have come to realise the depth of that potential and my lack of knowledge about that whole concept and skillset. 2016 will see me spending more time in my own school and hopefully connected to a few others in some way or another. The potential, as well as the challenges of learning and teaching in modern classrooms continues to energise me. Last Monday a group of our students attended an excursion in our city. They visited the Immigration Museum and explored many exhibitions and wandered the city noting historical changes. 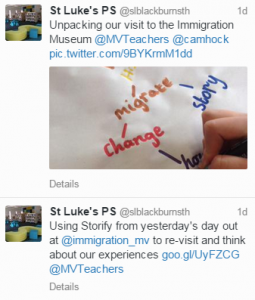 The experience was well documented by the Tweeting teachers as well as the Museum Educators (@MvTeachers) . Anyone watching from afar was well informed and connected to what was happening throughout the day. The Tweets were then curated into a Storify – capturing a timeline of the events and enhanced by the ability to add relevant weblinks. Back at school, the Storify became a journal of the days events, shared on the class blogs. It was also used to enable a de-brief of the day before the students began unpacking the ideas they explored. It can be edited to show the follow up and further aspects of the learning. A tool that I once saw from one light only (capturing a series of Tweets), I now see with a broader lens. I wonder how else it might enhance our learning? This week’s #YourEduStory prompt is “How are you, or is your approach, different than your favourite teacher?”. I admit I struggled with this one and was interested to read that many others did too. It has however made people think about the qualities of their favourite teacher, so I think I will stay with that idea and perhaps the differences will stand out. were not afraid to show their personal side. They connected on a personal level – made an effort to know their students well. They acknowledged the individuals in their class and acted accordingly. were knowledgeable but not ‘know-it-alls’. They had sufficient skills and knowledge to guide and direct but not lecture. were just. This was a vital trait as there were many who were not and that stuck out as my most negative feeling about schooling. Teachers who punished a whole class for the actions of one or two made me angry and upset and unfortunately it was a common method. Perhaps I am showing my age on this point. When I think back to those moments in my life where a teacher had an impact, it is never really an ‘aha’ moment that pops up but a hand held out just at the right time. I believe myself to be a teacher who does the same. Teaching is not about content but about taking the journey with young people and building rich relationships. I stole and adapted elements from each into my own “teacher persona” – that conglomeration of influences that make us all who we are in the classroom…….And from all of them, I learned the importance of creating a family in the classroom: how difficult that is, and how magical it is when it happens. I hope I am not too different from my favourite teachers. I know I have opportunities that they did not have but in the end the crux as Steve said is about relationships and that has not changed. My personal issue with a job that does not give me much time face to face with students or the teachers that I work with is how to ensure the relationships are strong. My first reaction is the pragmatic response – I can’t change the world. Then of course I keep thinking and know that I can change a small corner of it even if it comes down just changing me. I was lucky enough to hear Annie Parker speak about Entrepreneurial tips last year and one point she made was to celebrate small wins – don’t wait to you have changed the world, but accept and be grateful for minor successes. Today I received a gratifiying reply to a comment I left on an ex-student’s blog. He has just left our school and during the break between primary school and high school took the effort to transfer his old blog contents to a new place (required by our system) . Jonathan was a keen blogger and in Years 5 & 6 showed a flair for writing posts that helped others understand some of the technical elements of technology we were using at school. He was self motivated, encouraging and showed flair. I am happy a celebrate the small success here. At least this student and perhaps a few others have been introduced to an activity that they see value in, a place where they can contribute and share. Who knows what will happen – I too look forward to what Jonathan will write as he gets older. So I have not changed the world, just a little corner of it and I did not do that on my own either. The other teachers who work with our students are all part of the puzzle. All too often teachers do not see the immediate results of our interactions with students but as Teresa wrote “I teach” and therefore I change the world in a number of ways, allbeit sometimes small, nevertheless good. 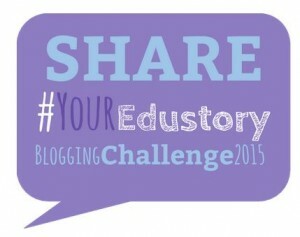 This post is part of the Blogging Challenge #Your EduStory and here are two other responses to the same topic for other perspectives – Enjoy!